Arugula in a salad – and that’s the end of my usual thinking about this peppery-flavored green which is populating my CSA box at the moment. To exit the salad rut, I decided to use it as a flavoring herb in spaghetti sauce. It’s strong flavor meshed very well with the richness of the sauce – I might even add more next time. Be sure to treat it as you would a fresh herb and stir it in right at the end. Place a large saucepot or Dutch oven over medium heat and add the olive oil. When the oil is hot, add the onion and garlic. Cook until the onion and garlic are soft but not brown. Add the pancetta and continue to cook, stirring, until the pancetta is cooked. In a separate frying pan, cook the ground beef until cooked through and brown. Drain well. Add the tomatoes, oregano, bay leaf, salt, cooked ground beef and 1 cup water to the onion mixture. Stir together and taste to see if it needs more salt. Bring the sauce to a boil, then reduce the heat to a low simmer and cover the pot. Let the sauce simmer for 30 minutes to 1 hour. Turn off the heat and stir in the arugula. Serve over cooked pasta. 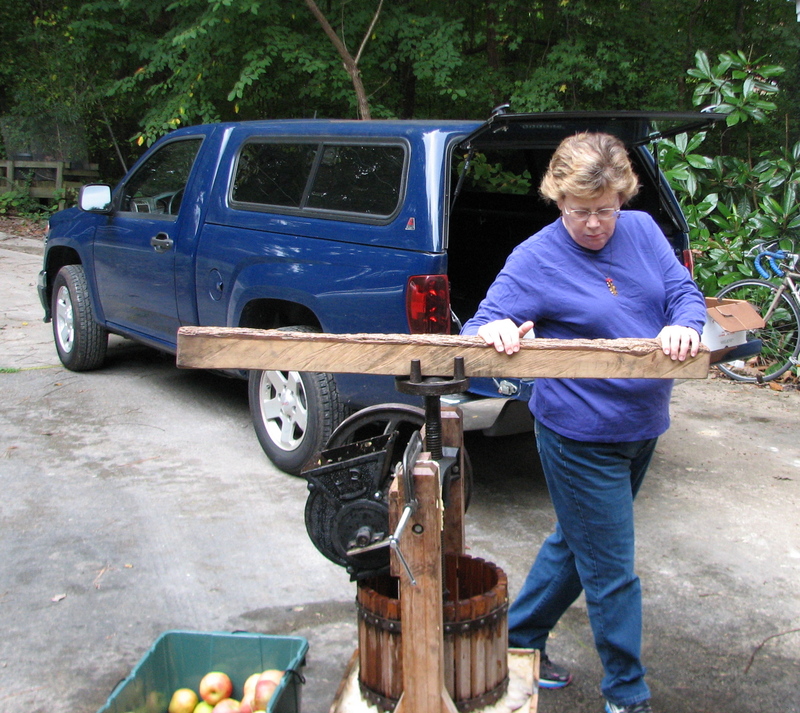 The Hub knows some interesting people, including a couple who own their very own cider press. 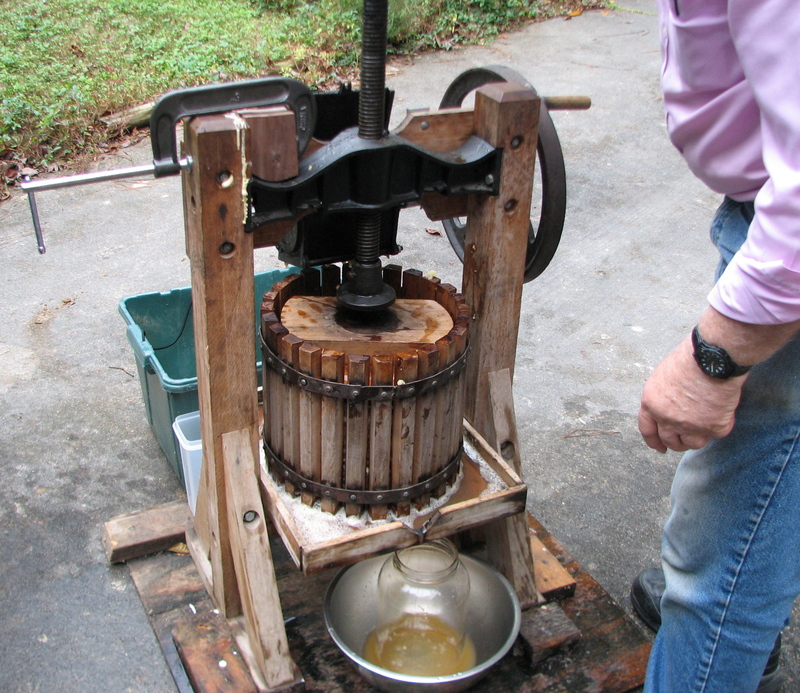 Each fall, they throw a apple cider-pressing party. After attending, I know why. Pressing cider is hard work. Surprisingly, my minutes of dedicated effort on the gym’s weight machines did not prepare me for the cranking involved to grind up the apples. Apples went into a hopper that contained a revolving drum with small sharp teeth. The drum to be hand-powered to grind the apples to a pulp, which fell into a mesh-lined wooden tub. When the tub was full, a round wooden disc was placed on top and the pressing began. A metal screw cranked the pulp down, releasing the strained cider into a glass jar. I found the pressing easier than the cranking. Especially when our party host inserted a wooden log that enabled me to press the apples by walking around in a circle like a plodding yak. The fresh cider that emerged was heavenly, like the concentrated essence of apple. Each batch tasted a little different because different combinations of apples went in. We took some home in exchange for our labors. I froze most of it and we sipped the rest. I asked the hosts why they had a cider press. They even left it with a trusted friend for babysitting when they lived in Florida, where they assumed apples would be scanty. They looked at each other, baffled. The best they could come up with was: “We like cider.” They freeze a lot of it. I also began to wonder what exactly was the difference between apple cider and apple juice – leaving hard cider out of it, which has an obvious difference. I asked Harley Prewitt of Apple Hill Orchard & Cider Mill near Morganton, who said that both apple juice and apple cider are pressed exactly the same. fiber is removed. Supermarket apple juice is also pasteurized at a high temperature. The combination of filtering and pasteurization leave a crystal clear liquid, Prewitt said. 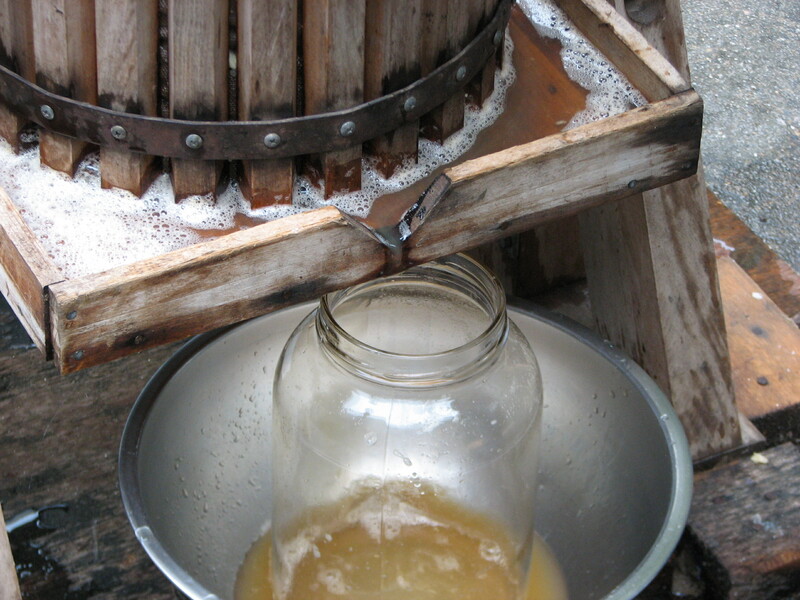 Apple cider is much less filtered, and contains pectin and crude fiber. “Most of our customers expect and desire some ‘settlings’ in the bottom of the container,” Prewitt said. He “flash pasteurizes” his cider, which makes it look and taste unpasteurized. Prewitt added that, the day before I contacted him, he had made 200 bushels (8,000 pounds) of apples into 650 gallons of cider. That’s a lot of cranking. 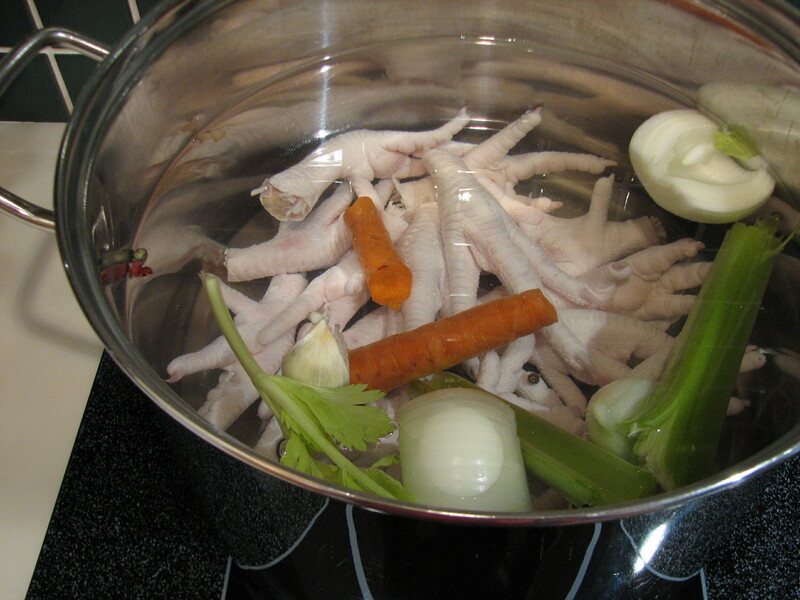 Chicken feet….that’s something you don’t wake up every day thinking about. But I did today. It’s October, the neighbor in the next block has put up a pulsing mass of orange Halloween lights and it’s getting chilly. So it was time to lay in a supply of homemade chicken stock in my freezer. It’s great on a cold night to know the base for soups, stews and other such warming things is waiting for me. Usually I simmer stock from leftover bones from roasted chicken, after having consumed the chicken (it’s like free food). But I could find no chicken bones in the freezer, just bags of summer’s blueberries and The Hub’s Wolferman’s muffins. I remembered Hub telling me that his mother always said that chicken feet made the best stock, although he never saw her actually use them. There’s a lot of gelatin and collagen in the feet, which makes a rich stock. But where to find them? I called Larry’s Super Market in Raleigh and they almost laughed – of course they had them, the man said. The center of Larry’s, which has been open for 44 years, is its meat counter. The produce and other stuff are mere garnishes. Larry’s sports varieties of meat that even I’ve never cooked, and I’m a native, carnivorous North Carolinian. Need pork necks or souse (aka head cheese)? Larry’s can satisfy your craving. The butcher told me that they always have chicken feet because many customers get upset if they don’t. At $1.39 a pound, I bought enough for two huge stockpots. At home, I rinsed them and followed my usual stock-making technique. I added onion, carrot, celery, a couple of garlic cloves and a few peppercorns, then covered it all with water. When the water came to a boil, I reduced the heat and let it simmer for about 3 1/2 hours. I usually like to go for 4 hours and some change, but I had to leave the house, so I cut it short. After cooling and straining, I tasted the stock. The flavor was definitely richer than my bones-only stock, and it had more chicken aroma. However, there was the matter of those stewed chicken feet reaching up from the bottom of my trash can. It seemed that the more they were cooked, the more they resembled long-fingernailed alien hands. Wonder if the neighbors need some more decorations?